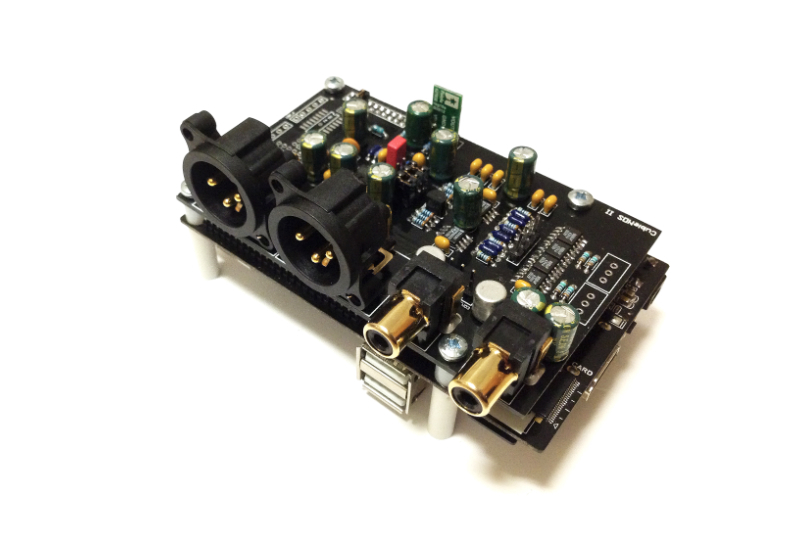 CN II is an 16-bit stereo audio reference DAC module designed for A10-Cubieboard and A20-Cubieboard. Based on dual Philips D/A converters for fully balanced design and a Burr Brown buffered output stage with enough power to drive low impedance headphones. CN II has additional input selector with 3x S/PDIF as an extra option, which makes it a DAC module that can be used with basicly any audio source. CN II is truly an high end module for Cubieboard which is easily installed and doesn’t require any soldering or electronic skills. It’s a finsihed soldered add-on card, installed within seconds. It can be used in two different configurations. Since most of the digital music is recorded in 16bit/44.1 kHz we have adapted a D/A convertion design with this in our thought. Configuration A of CN II is a non oversampling DAC. Meaning, if input feed is 44.1 kHz, CN II outputs 44.1 kHz. Configuration B of CN II resamples the audio to a fixed frequency at 176.4 kHz. Note that 176.4 kHz still is equally divisble to 44.1 kHz which in turn doesn’t add jitter to 44.1 kHz audio.